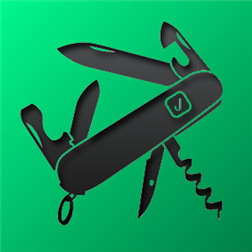 Jack of Tools Pro makes your phone into a virtual tool belt. Want to know exactly where you are? Ever wonder how fast that roller coaster ride really is? How high are you? Or maybe you just want to get that desk level. Jack of Tools Pro includes an LED flashlight, compass, geographic camera, virtual level, your Earthly coordinates, your altitude, your speed and heading (including average and maximum speed markers), base distance, a caliper, a magnifier, and a sound meter. Additional features include the ability to post your current location, current speed, average, and maximum, store, find, and share up to 50 locations, “see-through” compass mode, reverse geocoding of current location and bases, current altitude history graph with maximum and minimum, and speed history graph with maximum and average. Jack of Tools Pro includes options to keep your phone from going idle while you use it (Continue on Idle) and allows you to control the sampling if you want to adjust accuracy vs. responsiveness. Selectable Metric or US Standard units as well as UTM. Optional compass reading as Magnetic or True Heading. Voice control: launch a tool by talking to your phone! See FAQ. Trial version can be used indefinitely but does not include all tools and features. NOTE: Flashlight does not work with phones that have a charging flash such as the HTC Mozart. Compass does not work on phones that do not have compass functionality such as the Nokia 710 and 610, and the HTC 8s.